Simply put we are dedicated to creating teachers, (called Shidoshi's in the Bujinkan Ninjutsu system of Grandmaster Masaaki Hatsumi. We have established over the last 20+ years what we feel is the most comprehensive Ninjutsu study program available to the general public anywhere in the world. The International Bujinkan Dojo Association (aka American Bujinkan Dojo) and Bushindo Martial Arts University is the One Stop Shop for Authentic Ninjutsu Information, no one offers more information to the general public than we do. In offering our students a direct lineage to Soke Masaaki Hatsumi in Japan we have become the premier official Hatsumi (Quest Co. Ltd) video distributor outside of Japan. We secured English subtitles on Soke's videos so that you can better understand what he is teaching and now the conversion to DVD is in progress. We also secured distributors for his Japanese and English book titles and hired translators of his Japanese books (both in and out of print). We established a structured step- by- step Ninjutsu learning and ranking system all the way to 10th dan for interested parties. We have a Ninjutsu forum where students can help each other learn and find training partners. 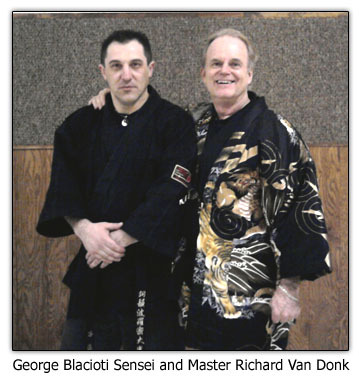 We have a Shidoshi training program and a how to open and run a successful dojo for our affiliated IBDA members. Every licensed teacher in Ninjutsu must be certified by Grandmaster Hatsumi first as a Shidoshi-ho (junior licensed instructor under a Shidoshi) and then as a Shidoshi (fully licensed teacher of the warrior ways of Enlightnement-5th degree rank is required). We now have many affiliated training groups and Branch dojo's and Bujinkan friends (Buyu) all over the world. Hundreds of our students are now Shidoshi (5th dan or above) and a many are Judan (10th degree level). We are proud of that success as it says we are doing many things right.